Finite Element Analysis (FEA) is the practical application of a mathematical method (FEM - Finite Element Method) to model complex structural and thermal problems. In very general terms, FEM is the method of subdividing complex geometry with unknown structural behavior into a finite number of simple geometric elements with known structural behavior, known as a FEM mesh. At the element boundaries, the displacements are equated with the neighboring elements and a matrix equation is developed. The equation is numerically solved, and you can see the results graphically using a post-processor. The results displayed show you the computed stresses, strains and displacement that occur in your model when forces are applied. 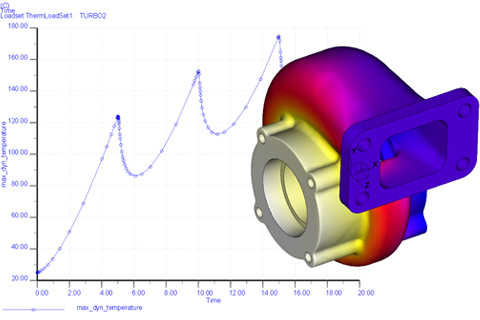 FEA enables simulation and is especially useful for structural and thermal analysis. Typically, engineers use simulation software, such as Creo Simulate and its extensions, to perform various types of analysis; such as structural, thermal, modal, buckling, and dynamic for both linear and non-linear problems. Basic simulation can and should be in the virtual toolkit of every engineer. The computed FEA results allow you to optimize your designs, by making changes and then easily re-running the various analyses. Incorporating simulation software early in the design process will help reduce the need for costly prototypes and late-stage design changes as well as improve product performance, longevity, and safety.